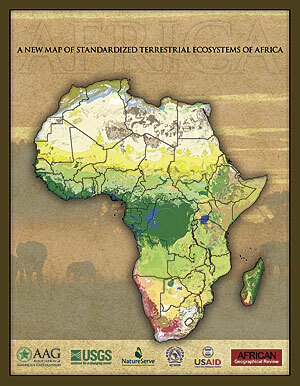 The AAG is pleased and honored to announce the publication of A New Map of Standardized Terrestrial Ecosystems of Africa as a special supplement to the African Geographical Review, an AAG journal edited and managed by the AAG's African Specialty Group in close collaboration with African scientists and one of the leading continent-wide geographic journals for African scholars. This stunning series of new and detailed maps of African ecosystems that comprises this special supplement was created by the US Geological Survey (USGS) in partnership with the conservation nongovernmental organization (NGO) NatureServe and with an international team of scientists from most African countries, as well as from North America and Europe. Significantly, these beautiful new maps also represent the finest spatial resolution (90 m base resolution) data of its kind ever produced for the entire continent. The new maps show the potential distribution of 126 ecosystem types modeled using a cartographic statistical regression approach based on knowledge of vegetation types and environmental features at more than 32,000 locations. It is the first continental map to show modeled vegetation types in their physical environments, derived from rigorous assessments of data. USGS and its partners developed several new continent-wide data layers and maps (landforms, lithology, soils, bioclimate regions, etc.) as inputs to the modeling process. African scientists developed a new ecosystem classification and provided sample points representing known locations of the newly described ecosystems. The Regional Centre for Mapping of Resources for Development, in Nairobi, was an in-region partner and host of key workshops for the project. NatureServe led the modeling efforts for the new ecosystem map, and 37 experts from 18 countries collaborated on this project, which was funded by US Agency for International Development (USAID). Esri mapping tools and software were central to the development of the new terrestrial ecosystem maps of Africa. The mapmaking was largely accomplished with ArcGIS, the raster processing was mostly conducted with ArcGIS (GRID), and the continent-wide maps were developed using standard Esri data on county/administrative boundaries for every country in Africa. These new ecosystem maps are a significant improvement over previously existing maps in several ways. For example, the final ecosystems map is a product of a sophisticated, predictive analytics modeling process that uses multiple input data layers for the entire continent and was created specifically for this effort. These input layers include a first-ever continental landforms layer developed from a 90-meter digital elevation model, a new bioclimate regions layer developed from long-term records of temperature and precipitation observations, and a new lithology (rock/substrate type) layer produced as a compilation of existing regional geology datasets. These ecosystem maps are thoroughly integrated with the physical settings in which the vegetation exists. The AAG has been involved for many years in working with universities, NGOs, and others in Africa, especially around themes of geographic science and sustainable development. These programs have included the AAG's My Community, Our Earth as a core program and have involved long-term partners, such as EIS-Africa, Harvard University, UN-HABITAT, the United Nations Environment Programme, the late Wangari Maathai's Green Belt Movement, Esri, and other organizations, and funding from Global Dialogues on Emerging Science and Technology programs, the Jane Goodall Institute, the National Aeronautics and Space Administration, the National Science Foundation, USAID, the US Department of Housing and Urban Development, the US Department of State's Bureau of Oceans and International Environmental Scientific Affairs, and private foundations. These collaborative efforts respond to needs as defined by Africans around issues of sustainable development, environment, education, and economic development. This new ecosystems map and its underlying data will provide a valuable and synergistic resource for all these efforts and organizations throughout Africa. The new maps also will be crucial for a broad range of conservation applications and, in particular, gap analyses to identify unrepresented or underrepresented ecosystems in protected areas. The maps also can support biodiversity, agricultural, and resource management strategies that incorporate an ecosystem approach. The maps will also contribute a new knowledge foundation for research on impacts of climate change, fire, and invasive species on ecosystem productivity in Africa and for better understanding the interactions of economic and social policies on the goods and services (e.g., food, fuel, fiber, water) that African ecosystems currently provide. I would like to thank Dr. Roger Sayre, an ecosystems geographer and senior scientist for ecosystems in the Land Change Science Program at USGS and the lead author of the special supplement to the African Geographical Review, for his input to this column and for his vision and sustained leadership of this complex and enormously valuable mapping project. The complete article, "A New Map of Standardized Terrestrial Ecosystems of Africa," including the new map series in full color and links to the underlying data for these maps, is available free of charge on the AAG's website.